Jagan Kumar has created history at Round 2 of the FIM Asia Road Racing Championship at Sentul, Indonesia. 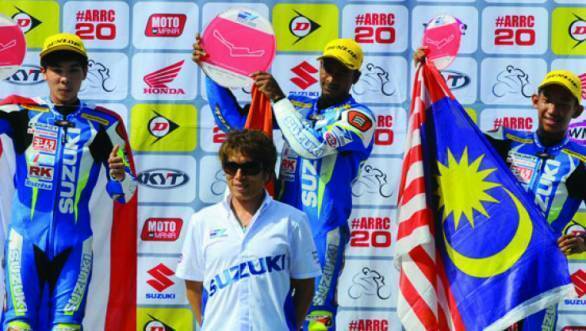 Competing in the Suzuki Asian Challenge, Kumar was on pole position for the race, from where he took a commanding victory. The 27-year old Indian rider had a good weekend, overall. He was second-fastest in the first practice session, and fourth-fastest in the second practice session, and then set pole with a time of 2min 01.903sec. He thus also became the first Indian rider to take pole position at the Asia Road Racing Championship. Starting the race from top spot, Jagan controlled the 13-motorcycle strong grid and kept calm even though he was doggedly pursued by Patis Chooprathet (Thailand) and Nazirul Izzat Md Baharuddin (Malaysia). Ultimately it was Jagan who finished first, beating Patis by 0.161s. Malaysian rider Muhammad Zulhilmi Yazid finished third. "This is my first international win and I am so happy to be able to gift this victory to all two wheeler fans in India. Let's hope that this will be the beginning of more victories to come," said Jagan.